Should a project like SETI detect a signal from an alien source, it would indicate that the aliens must have technology that operates on principles we understand. This would allow for two possibilities. The first is that when the alien signal was sent, their technology was about as advanced as ours. The second is that it is more advanced than ours and is backward compatible. The other point to remember is that the vast majority of stars in our universe are at such great distances that it takes many years for radio based signals to traverse the distance. So if we receive ACOM from a system ten thousand light years away, it means that ten thousand years ago they had radio transmitters. Assuming their race has survived their technological adolescence, at the time we received their transmission, they would therefore be ten thousand years more evolved than when they sent it. These time and distance relationships also mean that if radio telescopes are our most advanced technology, the likelihood of detecting civilizations less advanced than ours is very small. By the time we receive a ten thousand year old radio transmission, it's conceivable that the civilization that sent it could have created advanced exotic transportation technology that would allow them to physically travel here. If such a thing were to happen, and the aliens do not want us eavesdropping on them, there is no reason to believe that our equipment would be able to detect them. Radio may be as primitive to their receivers as smoke signals are to digital televisions. Simply because they are not on our wavelength does not mean that aliens do not exist, or that they are not already here. 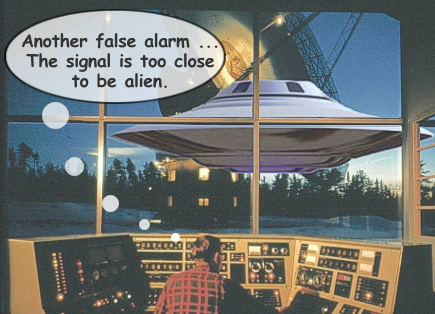 A UFO could be hovering right next to one of our radio telescopes and SETI scientists wouldn't know it was there unless they actually looked out of their control room window. None of this commentary is intended to diminish the role of SETI scientists or other similar endeavors. From a scientific point of view, these are exceptionally worthwhile projects and are probably the best chance we have of scientifically proving the existence of alien civilizations. The attitude of USI is that it is unfortunate that an air of adversity and ridicule remains between scientists who believe that alien visitation should be taken seriously, and the so-called scientific establishment.